After “remarks appropriate to the occasion” were made by several officials, “deposits” were made into the cornerstone. Included was “the name of the architect of the Odd Fellows’ Hall, Joseph French,” said the Tribune. If, indeed, the report was accurate, both architect and his partner had reason to be insulted. Joseph Trench, not “French,” had taken John Butler Snook into his practice a few years earlier. 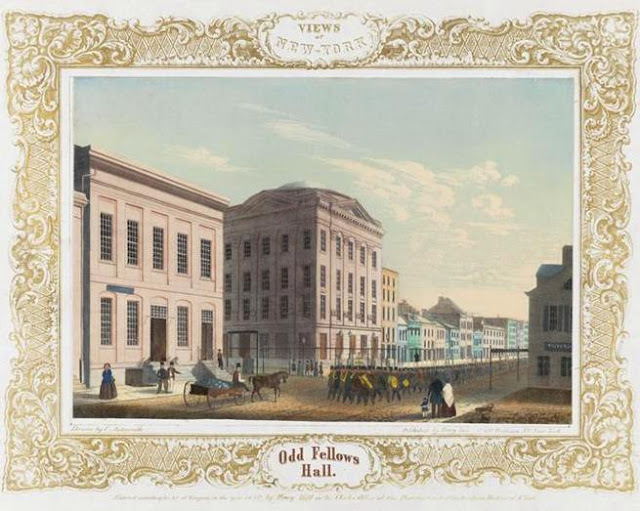 Modern architectural historians credit Snook as having major input in the design of Odd Fellows’ Hall; but he was snubbed by the Odd Fellows’ who ignored his participation in the paperwork within the cornerstone. Nearly a year later, on March 1, 1848, a New-York Daily Tribune reporter was back to investigate the progress. 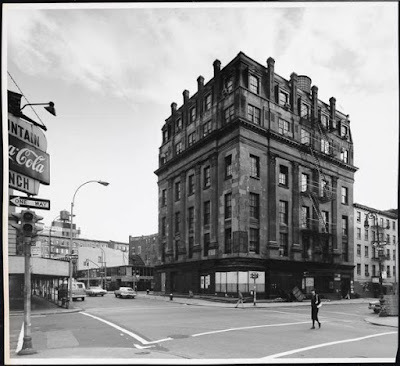 “It is really a magnificent edifice, an ornament to the City—chaste, elegant and well-proportioned—front Centre-st. 77 feet, on which is the main entrance, 71 feet on Grand-st. and 105 on Orange-st.,” the newspaper reported the following day. No matter whether Trench worked alone or with Snook, the structure was indeed impressive. 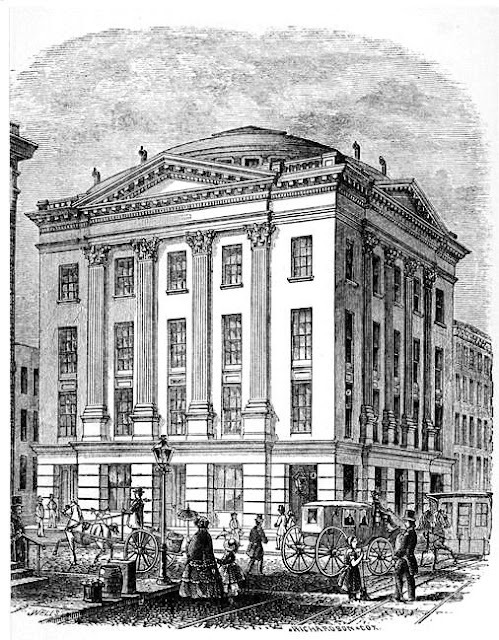 Four stories tall, each elevation featured three-story fluted pilasters that supported a classical triangular pediment. The rusticated first floor was designed to accommodate 19 commercial spaces which would provide rental income. Above the roofline was a drum and shallow dome that rose 98 feet from the sidewalk. The New-York Daily Tribune estimated the cost at completion at $100,000—about $3 million in 2015. 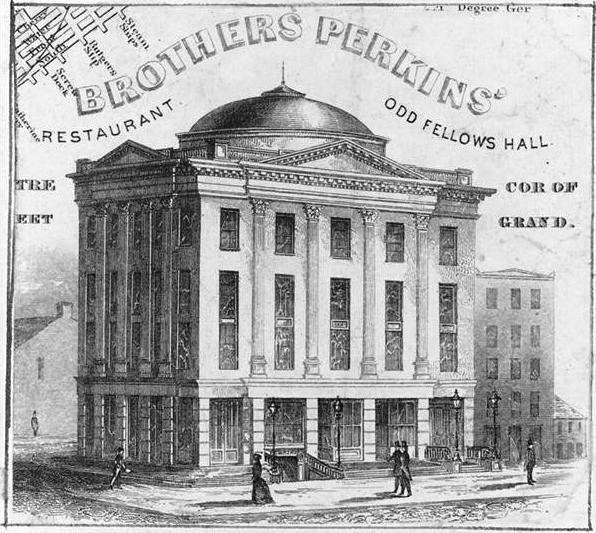 Several years later the elegant interiors were described by Miller’s Stranger’s Guide for the City of New York in 1866. “It contains a series of highly ornamented lodge-rooms richly furnished and in different styles of architecture: some Egyptian, Grecian, Elizabethan, &c.” The period-themes of the Lodge Rooms were suggested by their names: The Gothic Room, the Corinthian Room, the Antique Room, and the Egyptian Room among them. These room were routinely used not only for meetings, but for the funerals of members. On December 2, 1857 patrons of the restaurant were horribly frightened when an explosion occurred below the building. Someone had carried a lighted candle near an open gas jet between 1:00 and 2:00 that afternoon. The explosion that followed was powerful. By 1862 the restaurant was being operated by Dorset & Brown. Next door was the clothing store of William Grant. As had happened five years earlier, an open flame caused problems in the cellar below Dorset & Brown’s restaurant on October 13, 1862. The resulting blaze filled the restaurant with dense smoke and flames which “made considerable headway before they could be extinguished.” The Odd Fellows’ Hall suffered $2,500 in damages; the restaurant $6,000 and William Grant’s clothing store about $300. In the meantime, the Odd Fellows’ Hall leased space to various organizations for meetings, presentations, and other events. 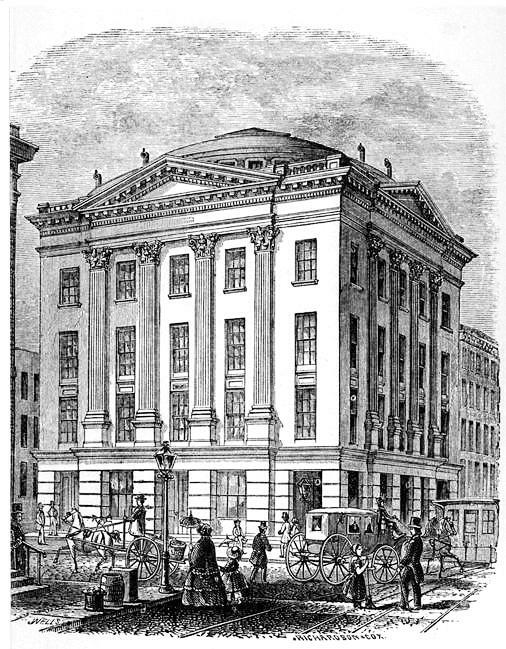 In 1869, for instance, the Williams Literary Union held its monthly meetings here. In 1881 it was evident that the majority of the members were willing to leave the changing neighborhood. But not all of them. Just as the building came up for auction on March 15, 1881, one member stepped in. Dunhan was eventually out-voted and the elegant building was sold to Robert Hoe, one of the principals of the printing firm R. Hoe & Company. Hoe commissioned architect John Buckingham to convert the structure for factory purposes. The grand interiors were gutted and the “Rotunda” and dome removed. In their place a two-story mansard, having nothing to do with the architecture below, was conspicuously added rather hat-like, which resulted in the loss of the pediments. The neighborhood continued to change—becoming part of the Italian District at the turn of the century and then engulfed by Chinatown. Throughout the 20th century the old Odd Fellows’ Hall saw the comings and goings of a myriad of small businesses, while at the same time somehow avoiding drastic change to the façade. 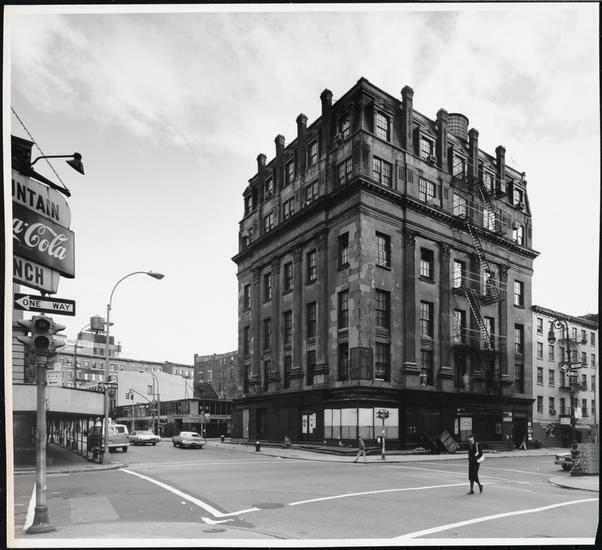 The building was given landmark designation in 1982—a move that stopped planned alterations by Bijan Nassi who purchased the property in 1997. 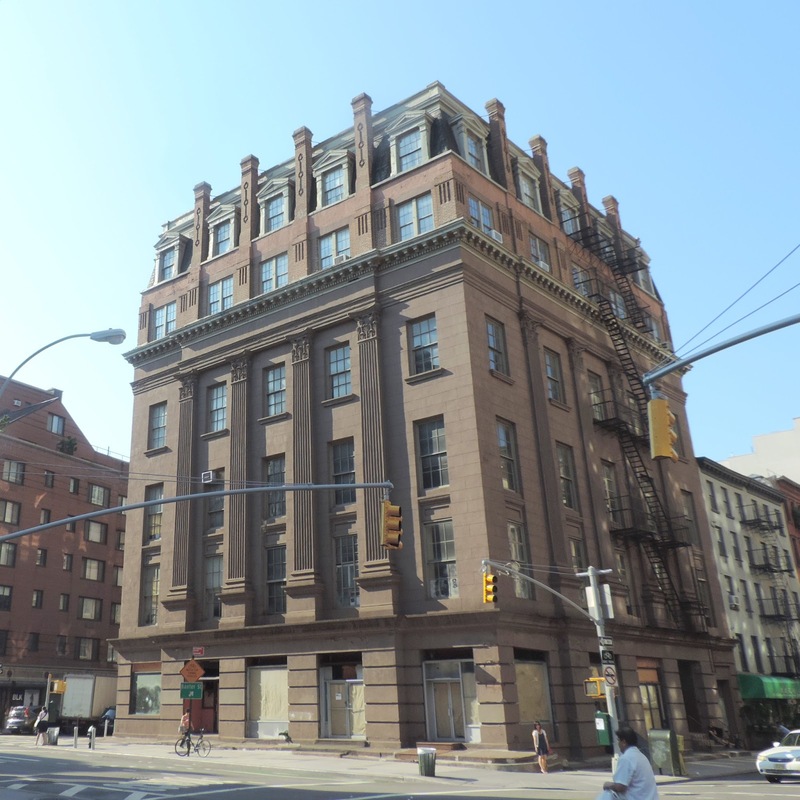 The antiques dealer hoped to convert the building into restaurant and office spaces, but was unable to meet the Landmarks Preservation Commission requirements. Despite Buckingham’s insensitive 1881 alterations; the old Odd Fellows’ Hall remains an imposing and impressive presence on Grand Street. It is a remarkable surviving example of private institutional buildings of pre-Civil War Manhattan.